How does Enes Kanter dominate the offensive boards? He shares his tricks of the trade. Enes Kanter is neither quick nor springy. At 6-foot-11, 250 pounds, he is a large man, but not by the standards of an NBA center, and his wingspan isn’t much greater than his height. Yet despite these relatively pedestrian physical characteristics, Kanter does something better than virtually anyone in the NBA: He is a dominant offensive rebounder. In each of the previous three seasons, Kanter ranked in the 95th percentile or better among big men in offensive rebound percentage. Last season, he grabbed 15.1% of his team’s missed field goals when he was on the court; only the colossal Boban Marjanovic and the long-limbed Andre Drummond were better. Typically, athleticism and effort are cited as the factors most closely tied to success on the offensive boards. Yet those two qualities are also seen as critical ingredients on defense, where Kanter tends to be a liability. So what gives? How is Kanter so effective in this particular aspect of the game? What are the secrets to his craft? Kanter also takes advantages of players’ bad habits. Watch the video from the Minnesota game again, and this time focus on Towns’ eyes. Towns is staring at the shot. And that leaves Kanter licking his chops. Take, for instance, a clip from Kanter’s time with the Thunder. Kanter ducks in early, looking like he’s trying to seal Giannis Antetokounmpo on a deep post-up. But he also knows that Russell Westbrook is handling the ball, and starts to plan accordingly. So Kanter retreats to the dunker spot, catches Giannis watching Westbrook and immediately sneaks back under the hoop. From there, he’s able to use his left hip and shoulder to wall off Antetokounmpo, and easily grabs the rebound. The centers picked up tricks from one another. Kanter says he improved his swim move by working with Adams, and now frequently uses it to get past a man trying to box him out. Of course, too many players don’t bother boxing out at all, and Kanter routinely punishes them for it. Towns has been a frequent victim. For example, here he is guarding Kanter in a pick-and-roll. 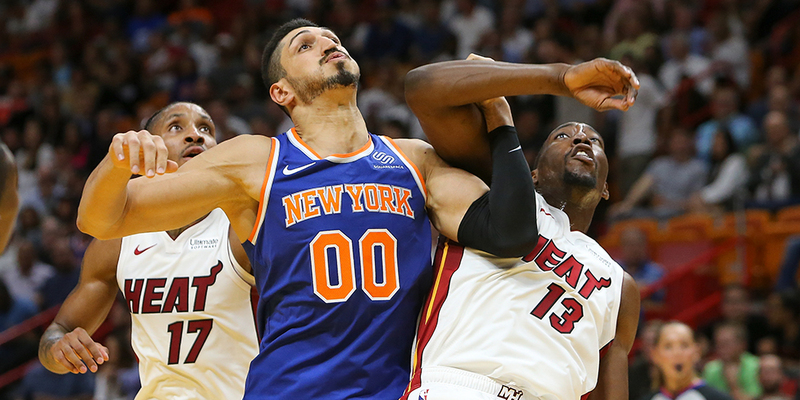 Kanter slides toward the hoop, leaving space for Frank Ntilikina to deliver a pass. But as soon as Ntilikina rises up to shoot, Kanter switches into rebound mode. Combined with Towns’ focus on the ball, it becomes an easy board for Kanter. And it’s another illustration of why individual rebounding stats aren’t necessarily reflective of good work on the boards. Towns has averaged 12.1 rebounds per 36 minutes for his career. But every year, the Timberwolves have been just as good on the defensive glass when he’s off the court as when he’s in the game, and they’ve been a bottom-10 defensive rebounding team each season. Meanwhile Robin Lopez has averaged just 8.4 boards per 36 minutes since he entered the league. But as Ben explained last year, his teams have always been better on the defensive glass when he’s in the game. And Kanter knows why. That leads to even more pushing and shoving than usual, and Kanter relishes that challenge. “You’ve just got to try to use your strength and wish him good luck,” he says. The other critical aspect behind Kanter’s success is that he embraces this role and plays to his strengths. Take, for instance, one particular play when the Knicks faced the Nets in their second game of the season. Kanter found himself holding the ball with his back to the basket and Caris LeVert on his hip. It was the type of scenario NBA centers dream about—an isolation opportunity against a smaller player. Most big men would have backed LeVert deep into the post and then tried to punish him around the basket. Instead, Kanter took one dribble and kicked the ball out to Trey Burke. 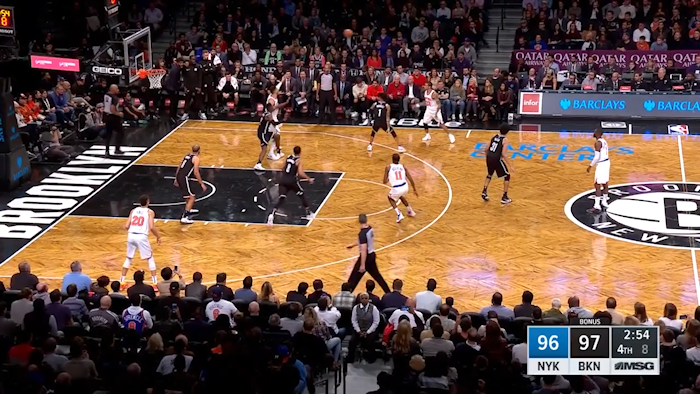 Sure, Kanter realized that the Nets would have double-teamed him had he made his way close to the hoop. But he also had something else in mind. The moment he released the pass, Kanter sprinted directly under the basket. 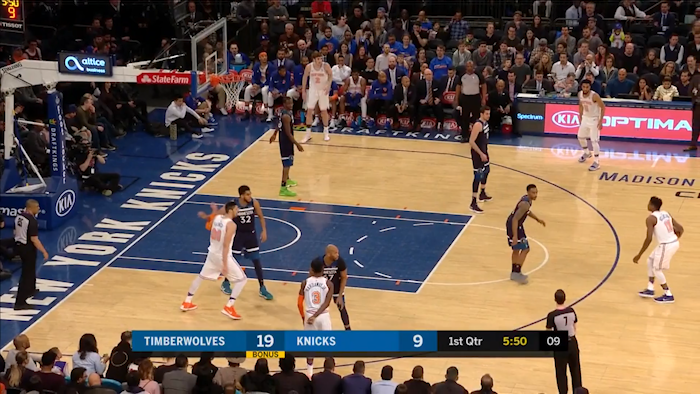 Burke launched a three-pointer, and when it clanged off the rim, Kanter gobbled up the offensive rebound and converted the putback to give the Knicks a one-point lead. A seemingly small play in an October game was, in fact, significant for a host of reasons. 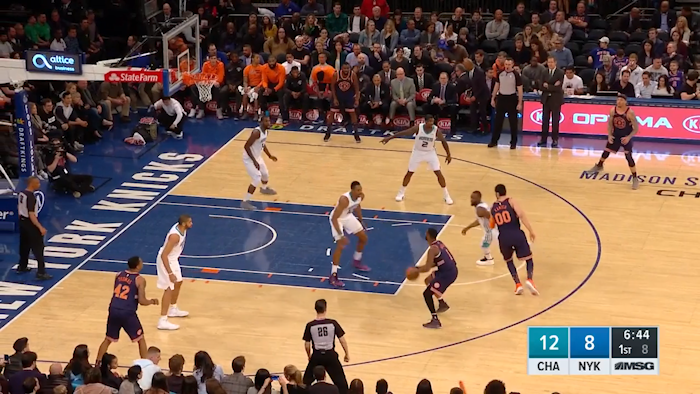 Kanter was unselfish enough to bypass a mismatch for an even better opportunity to score—the chance that Burke would either knock down the three or that the Knicks would grab the offensive board. But Kanter also showed a high level of self-awareness in recognizing that he could actually be more effective trying to grab a miss than in creating his own shot. Kanter remembered the play against the Nets well. “The guy behind me is a small man,” Kanter recalled. “So there’s no way he can guard me one-on-one. So I know they’re going to come double-team. So when the double-team comes, make the extra pass. But still, when the guy shoots it, the small is still going to be on you. With more teams emphasizing switching on defense, Kanter has found himself in that situation with increasing frequency. He says he doesn’t care whether he makes a move to score or puts the ball back in after someone else’s miss—two points are two points. But there’s an added benefit to his focus on rebounding ahead of his own offense. And with his sustained success in grabbing those rebounds, Kanter’s teammates have plenty of reasons to feel confident. Jordan Brenner is a sports journalist who has covered the NBA for nearly two decades. He is the former NBA editor for ESPN The Magazine.